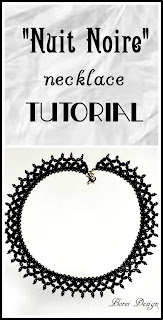 See how to make this beautiful diy statement necklace. Over the last year I have shared lots of general of arts and crafts project with you guys but my first loves are bead work and sewing. I still sew on a pretty regular basis but the huge storage bin where I keep all my beads has mostly sat unused over the last few years in my garage. Recently I thought about the tons of seed beads I had in there and got the itch to work with them again. I needed inspiration for a new project using them so I jumped on Pinterest. I struck gold when I ran across a site called BeadsMagic.com. 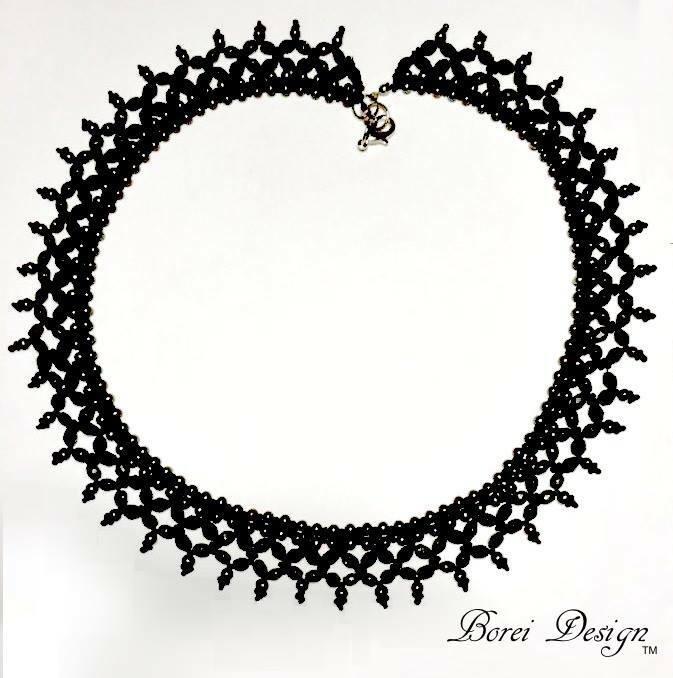 I found a pattern for a necklace I fell in love with and couldn't wait to try. I contacted the site owner and they were nice enough to give me permission to share the pattern with my readers as well! Yaaaay! Here is the stitching pattern. 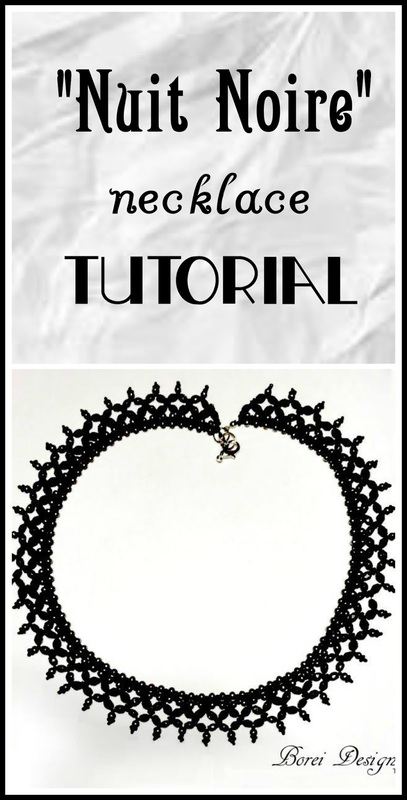 See original post: "Free Pattern for Necklace Noire"
*I didn't have any black beading thread or wire on hand and was too impatient to wait until after I bought some before I got started. I instead used black, hand quilting thread that I doubled up. 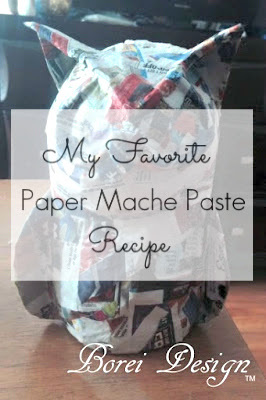 I have used it in the past to sew beads on fabric so I decided to give it a try for this as well. It worked but I would DEFINITELY recommend a strong bead thread made specifically for the purpose or at (very least) a few strands of embroidery thread which is much stronger. I'm going to cry if the quilting thread breaks. *I'm not always good at determining how long of thread I need to complete a row. I simply cut my thread to a workable length. When I started to run out of thread in the middle of rows, I simply added in a new piece of thread to the old thread using a slip not. I then tied few extra (regular) knots in the two threads and trimmed the ends of the former thread flush with the knot. I then continued adding beads to the new thread, sliding them over the knot to hide it. I don't know if this is the "proper" way to do it or not but this is what came to my brain and it works for me. *When I first started the project I tried to use regular, standard sewing-type beading needles. I was totally miserable trying to thread the doubled up thread into the tiny eye holes. Thankfully, I found and picked up a pack of collapsible eye, flexible beading needles at the craft store. 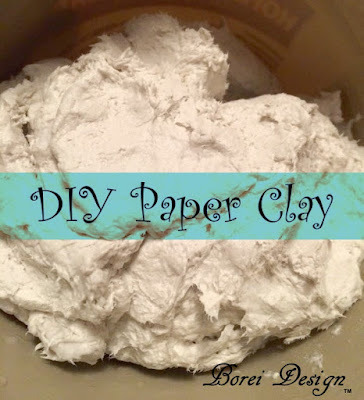 For the love of all things holy, find them and use them on this project no matter what type of thread or wire you are using! 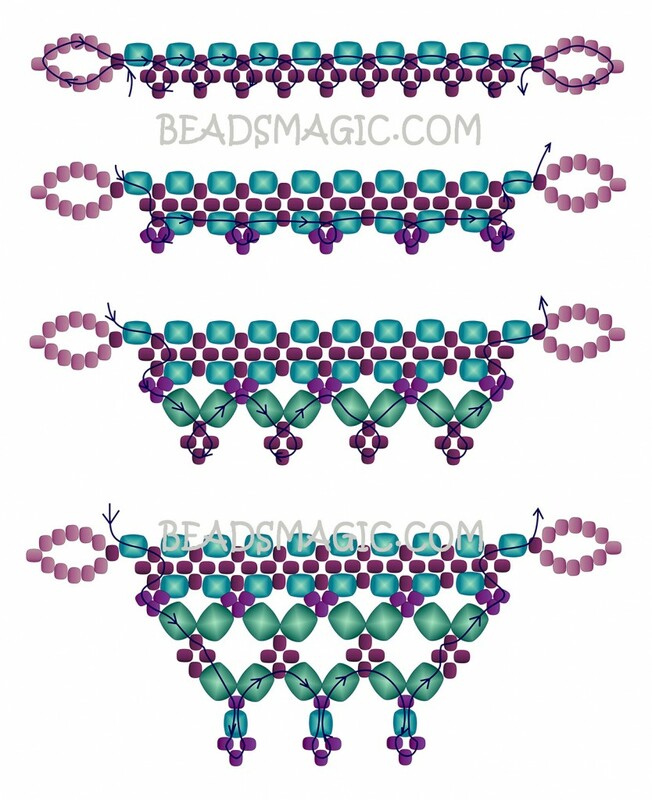 *I did not "tie off" or end my necklace using looped seed beads as shown in the pattern. I instead slipped on a 9 mm nickle bead tip (see the exact one I used here), added a crimp bead to the threads, trimmed the tails and then closed the bead tip over the crimp bead. I then used jump rings to attach a lobster clasp. Free pattern for necklace Sweet Garnet Bonus: This one also uses chip beads which I also have a bunch of. SCORE!